Voting for the first annual Inkwell Awards officially ended on the 31st of May and the results are now posted on the official web-site. If you read DC comics at any point during the past, ooooh say fifty or sixty years, then you know both the name and art of Ric Estrada. A native of Havana, Ric broke into the comic book world in 1948 and remained there since he retired (or was retired - take your pick) in the 1980s. In the 1940s and 1950s Ric worked for a lot of the smaller comics in the 1940s and 1950s - Hillman, Ziff-Davis, St John, Better, Feature, E.C. - and managed to forge a reputation as being a versatile artist. 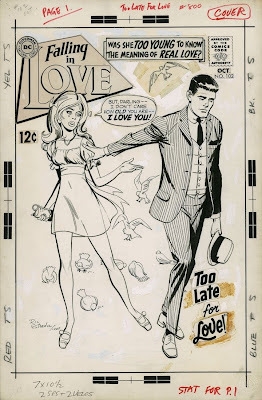 Be it anything from romance to war, Ric was there and ready to draw, and he did a lot of his work operating out of a studio with his contemporaries, Dan Barry, whom he assisted with Flash Gordon, Sy Barry, George Roussos, Don Perlin, Alex Toth, Frank Frazetta and Lee Ames.